I have just been reading an article in the paper regarding grounding. It’s big news apparently because it features on Gwyneth Paltrow’s ‘Gloop’. Those of us who work with energy though, know exactly how important it is to ground ourselves and I for one love the summer when I can be bare foot and in contact with the earth 24/7 🙂 In the winter I am also bare foot as often as possible even when it’s cold. 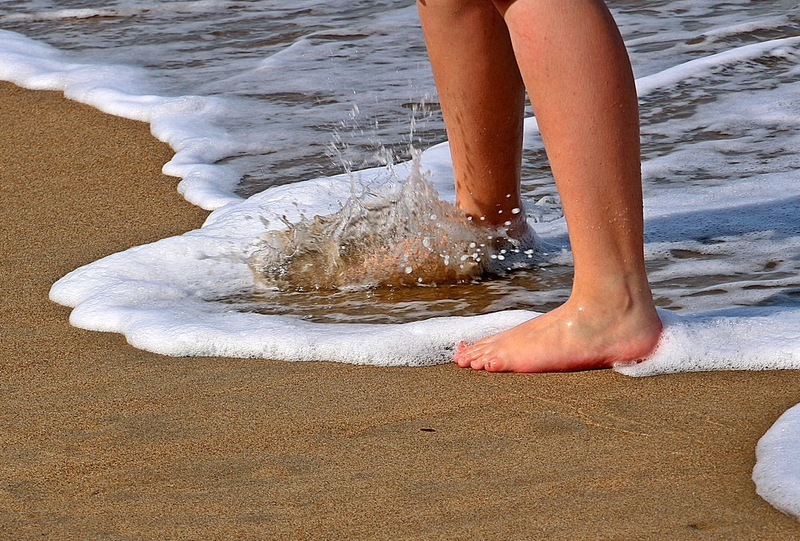 There is nothing nicer nor better for your health than taking your shoes and socks off an walking bare foot on grass, earth, the beach, anywhere really. It is Earth energy that feeds and nourishes our physical bodies, keeps us grounded, in touch with our bodies and which helps our physical bodies have what they need to heal. Grounding is a practice that can also help us ‘get out of our heads’ and so is also beneficial for our mental health. I also ground myself when I arrive in a new place when travelling. Connecting with the Earth energy of a new place or country can help to relieve jet lag and even altitude problems if arriving in a place where the altitude is high. So how do we ground ourselves? Like anything else there is no one way that works for everyone so the best way is to experiment and find what works for you. The following are some of the ways that I use myself and with my students. If you find it difficult to do these while you are reading you might like to get a friend to read them to you while you try them out or even record yourself in some way so you can listen and follow the steps. Go outside and find a quiet space with some grass, bare earth or beach, where you will be undisturbed. Take your shoes off and walk barefoot on the grass, earth or sand. With every step be aware of your foot and its connection with the surface you are walking on and with the Earth. As you walk, breath in deeply imagining the breath coming up through the soles of your feet as you place each foot on the Earth. Focus only on your breathing, the feel of the surface and the Earth energy as it flows into you. Sit quietly with your feet flat on the floor, without shoes is best, and make sure your spine is straight. Close your eyes and imagine, sense or visualise, roots flowing from the soles of your feet into the Earth (Don’t worry if you are not on the ground floor this will still work). Send the roots flowing down, spreading out beneath your feet, anchoring firmly into the Earth. Now breathe in deeply imagining the breath coming up from the Earth into the soles of your feet, up your legs and into your body. Continue this for a few minutes at least and with every breath feel the connection between the soles of your feet and the Earth becoming stronger as if a magnet is pulling you. Close your eyes and imagine, sense or visualise, a Lotus Flower opened out beneath you and yourself sat upon it. Imagine, visualise, sense or simply know that the roots of the Lotus Flower flow deep into the Earth beneath you. Now breathe in deeply imagining the breath coming up from the Earth into the base of your spine and into your body. Continue this for a for as long as you wish and with every breath feel the Earth energy flowing up into your body, breathing the energy up into you as far as feels comfortable for you. Feel yourself connecting even more strongly with the earth. Continue to breathe the Earth energy up into your body, up through your belly and up into your diaphragm under your ribs if it feels comfortable for you to do so. The first time I wrote about my oak was in April this year. At that time I shared a picture taken last summer. Over the winter the oak naturally lost its leaves and it was slow coming back this summer and I was concerned it had been lost. Last year I was told that they liked being planted with companions and that this where they were happiest and when I was gifted the oaklings I had made a mental note of the fact that wherever they were growing holly saplings were growing alongside them so I was wondering about planting the oak with holly. 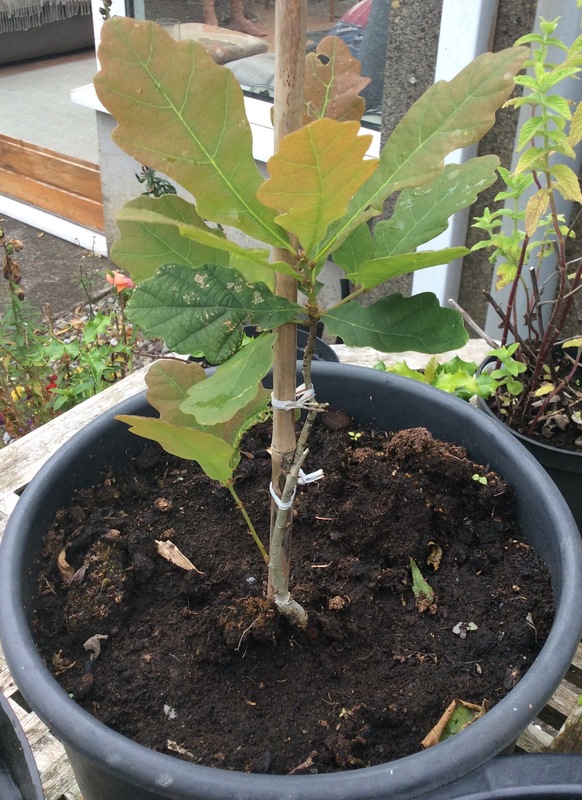 I then spoke to a fellow OBOD member who quite successfully grows oak from tiny saplings and acorns and learnt that his are potted in large pots and given room to grow. My poor oakling was in the tiniest pot and so a new home was found and it seems to be growing now. I’m hoping that if all goes well it may be big enough and strong enough this time next year to be planted out in the garden in its permanent home.